Whether you're a beginner or an expert the Sizzix Bigshot Starter Kit features everything a crafter needs for creating beautiful cards and embellishments and is ideal for making scrapbooks, picture frames, home decor, fashion embellishments and much more. Cut everything from paper, cardstock, magnet paper, fabric, craft metals, rubber, sponge and more with this ultimate roller machine. The Big Shot can use the entire Sizzix library (with the exception of Bigz Plus and Bigz Pro dies) and is compatible with other die cutting and embossing products. Cuts and embosses shapes up to 15.25cm (6") wide. 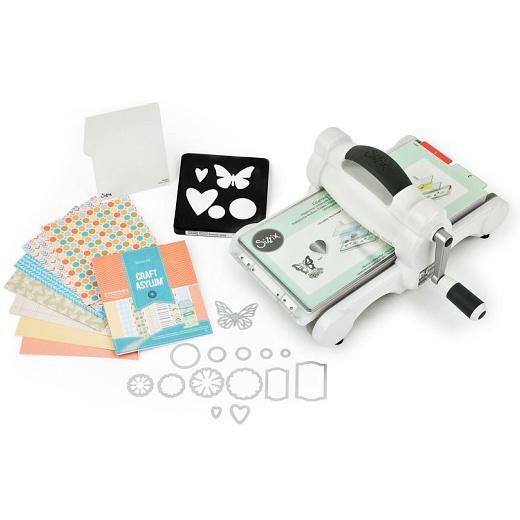 Included with the Big Shot machine are a pair of Cutting Pads and the adjustable Extended Multipurpose Platform, which makes all makes all Sizzix components thinner than a Bigz Die compatible with the Big Shot Machine and even works with other brands' dies and embossing tools! The diagrams on the Extended Multipurpose Platform offer easy guidelines about how to make the perfect Sizzix sandwich. The Big Shot Machine measures approximately 14 1/4" x 12 3/8" x 6 5/8" and features a three-year limited warranty.